Thanks, Martin. The snow was not a problem, here, in Prague. Thanks, Pete (Dizz) for the photos. Earlier, Cant Cove's official photographer photographed D6313 with its train from Penmayne, passing through Cant Cove. D6313 catches some sun, followed by BR Mk1 BG W80705 and two BR SR BCKs (usually used either as through portions of Waterloo trains or with the CIWL "Pullman" trains to / from the Continent via West Porthsea). The two BCKs are suffering from frost damage to their plumbing. A frost damaged CIWL "Pullman" coach was added to the rear of the train to be taken to West Porthsea for shipment back to the CIWL Workshops, in Belgium, for repairs. The rest of the train proceeded to South Devon. Already, D6313, the most reliable of all the NB Type 2 "Baby Warships ", is back in service after the incident with contaminated engine lubricating oil followed by the exceptional severe weather. 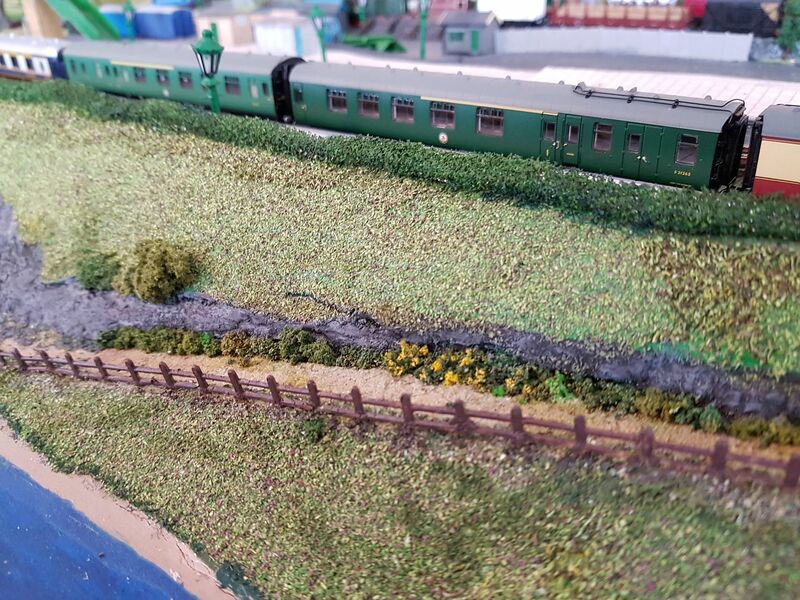 The recovery from frost and snow damage resulted in many unusual trains being seen formed of whatever serviceable locos. and carriages were to hand. Earlier, a photo. 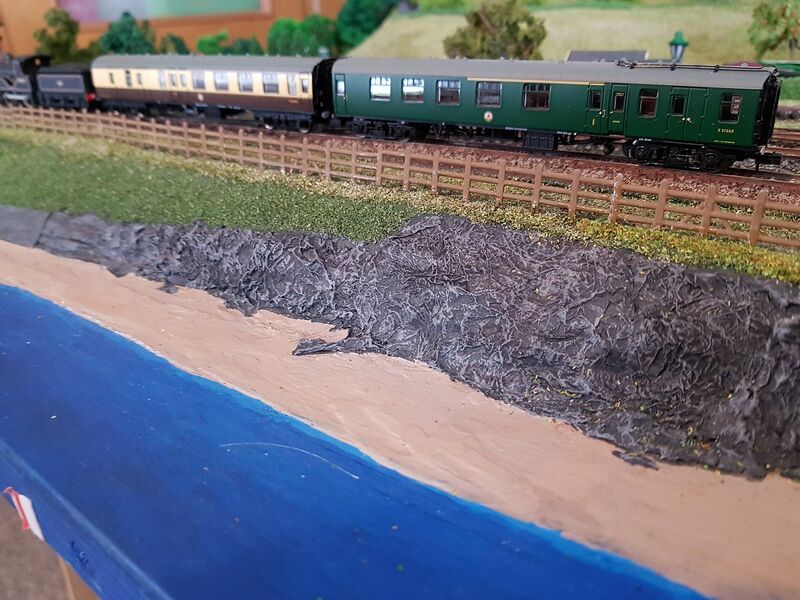 of a Q1 passing by at the head of an unusual combination of carriages, a BR Standard BSK and BCK in WR and SR liveries, was photographed at Trepol Bay. The same train, but behind Wadebridge's favourite loco., T9 No. 30313, (kept in a specially heated shed, at Penmayne, during the terrible winter weather) which took the train only to and from Wadebridge, was also photographed passing through Cant Cove on its outward journey to Penmayne before the return working to Wadebridge and Trepol Bay. More photos. 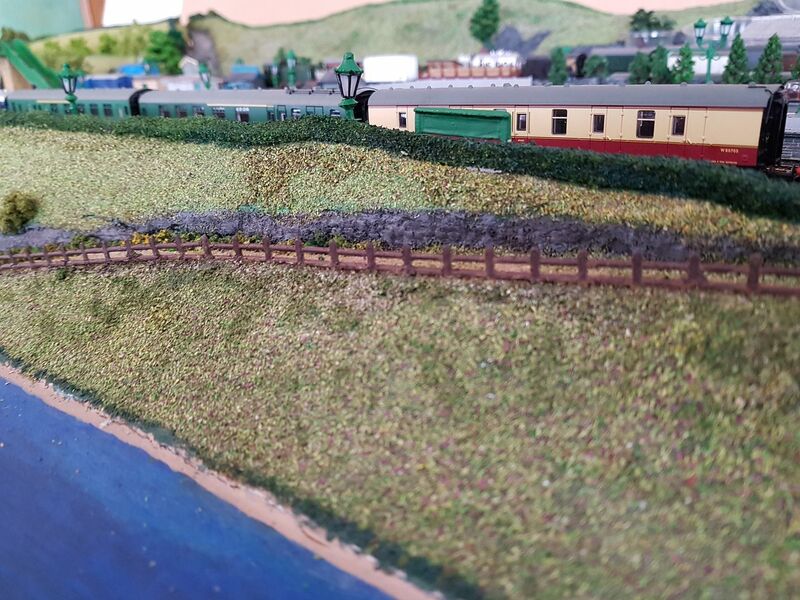 of the very unusual 'scratch' formations put together by the indefatigable Wadebridge Yardmaster, will follow. Thank you, Derek and Andrew. On the WR side, during the extreme weather, one of St. Blazey's 4575 'Prairie' tanks, fresh from overhaul at Swindon Works (funded by the GWS, Bodmin's local sponsors) has proven most reliable. The loco. shed at Bodmin General was kept specially heated. However, with one B Set away for annual overhaul, at Swindon, and the other suffering from frost damage, the loco. 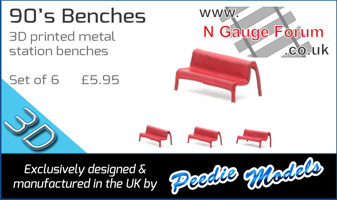 had to be paired with another 'scratch' set assembled at Wadebridge Yard. Fortunately, plenty of coaches are available. The train photographed, here, is a Penmayne-Wadebridge-Trepol Bay-Port Perran-Truro replacement service. The CIWL Pullman and SR CK being worked through to West Porthsea. As no ETH fitted diesel was available, as the local BRC&W Co. Type 3s had been recalled back East, the CIWL Pullman coach could not be heated and the few hardy Continental passengers were seated in the BR SR CK, instead. Due to the lack of heating for the "Pullman", unfortunately, it suffered frost damage and, despite having been freshly overhauled only weeks before, had to be returned to the CIWL Workshop at Ostende, Belgium, which is managed by the charming, Jean-Luc, who is is very good friends with Monique (the Parisienne "Chelsea Girl"). Keeping the GPO parcels and mail service running is also a priority so a BR WR Siphon G, W2936W, freshly outshopped in BR Crimson, was added and will also be worked through to West Porthsea. A type of steam loco. 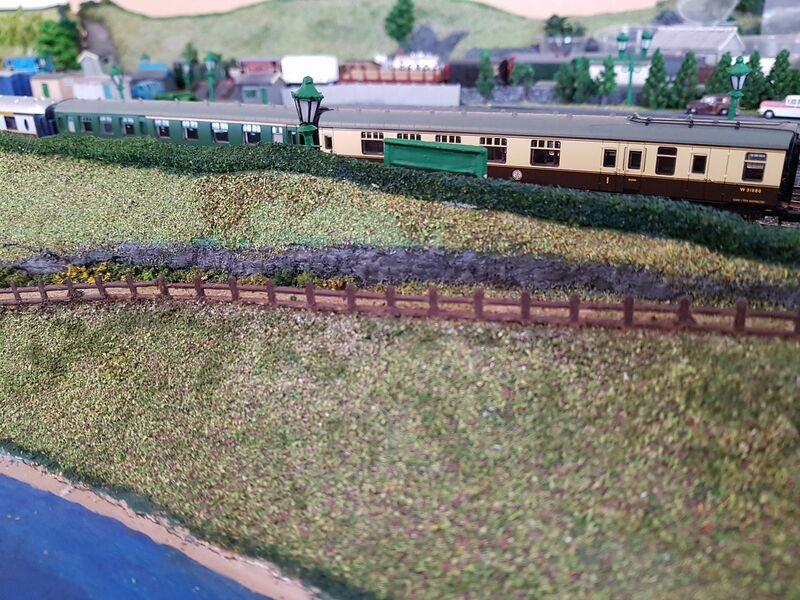 not recently featured is the BR Standard 4MT 2-6-4Ts allocated to Exmouth Junction (72A, then 83D from 9/63). Locos. recorded in 1962 include: 80035, 80036, 80059, 80060, 80061, 80062, 80063, 80064, and 80067. Unfortunately, my (all older Graham Farish) models of 80036, 80041, 80064 (although all DCC-fitted) are awaiting detailing and renumbering from their present identities. So, 80064 will be the priority. 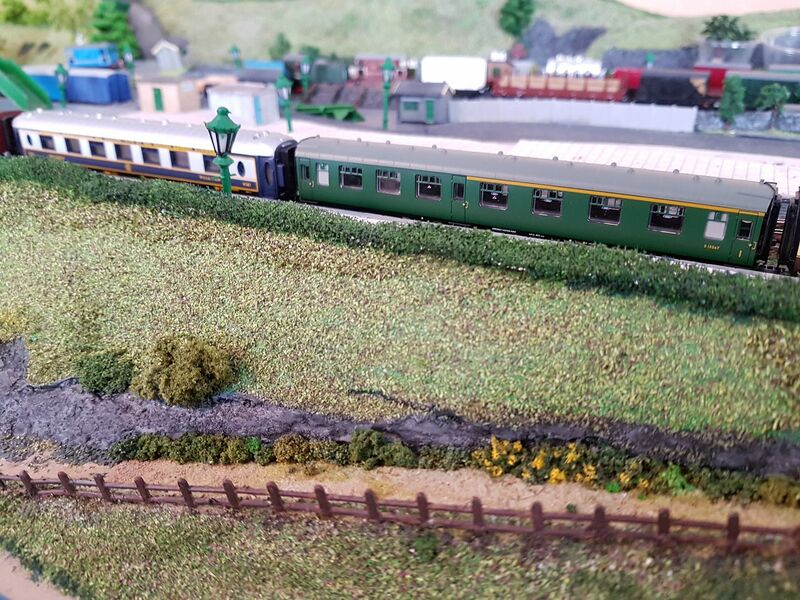 At present, I only have two Graham Farish Bachmann DCC fitted by Wickness locos. here: 372-525 - 2-6-4 4MT TANK LOCO 80097, to be renumbered 80037, and Graham Farish Bachmann 372-529 2-6-4 4MT TANK LOCO 80130, to be renumbered 80041. The following were seen, in 1964, in North Cornwall: 80037, 80038, 80039, 80041, 80042, and 80043. So, there is no rush for 80041 as 1964 is very close to the end of Martin's chosen time period. Their 'sisters', the BR Standard 4MT 4-6-0s allocated to Exmouth Junction (72A, then 83D from 9/63), did not appear until 1964, and include: 75005, 75008, 75022, and 75025. My plan is to have double chimney 75022 and, maybe, single chimney, 75025. But, again, there is no rush as 1964 is very close to the end of Martin's chosen time period. Their smaller relatives, the BR Standard 3MT 2-6-2Ts, very rarely worked in North Cornwall, being only used on the Bude line, from at least 1961, carrying BR Lined Black livery. Possible locos. include: 82017, 82024, and 82035. My Graham Farish by Bachmann 372-326 2-6-2T, 82005 BR Lined Green, will be renumbered as either 82030 or 82042, both 83D. When, eventually, 372-331 82020 BR Plain Green LC is released, this will become 82040 (83D). All these were seen in North Cornwall at the end of steam, in these liveries. Thank you for the latest photographs. I’ve always rather liked the little Dapol 45xx tanks in green. Dapol N - ND-035 45xx Small Prairie Straight Tank BR Lined Green Late Crest 4565 (83E). Dapol N - ND-013 45xx BR Green Early Crest Unlined 4570 (83D 6/62-1/63). Not DCC-fitted, but here: Dapol N - ND-035 45xx Small Prairie Straight Tank BR Lined Green Late Crest 4565 (2), to be 4569 (83E), after DCC fitting by Wickness. Additionally, there is: Dapol N - ND-023 45xx Straight Tank GWR Livery 4527, DCC-fitted, here, [broken buffer, to be repaired when renumbered] to be preserved 4547 [83E]? There are also quite a few 4575s in BR Green. However, only two have been DCC-fitted and none have been renumbered to ones that worked in Cornwall (or Devon). One will be push-pull fitted, as 5572. I can feature the first two of the 45xx locos., in the next photos. Yes. They do look good in green. My daughter and two small grand children have now departed back to Bath so this afternoon the spare bedroom will revert to a railway room. Sinnce I made modifications to the baseboard prior to Christmas, it’s now a pretty slck operation that I can do all by myself except that I do need literally 2 minutes of Mrs PP’s help to lift the fiddle yard back onto the tables. I hope your visitors enjoyed themselves, Martin. Good to know that you can quickly, and more easily, restore your layout to full operation. This week will be the last for months when I have any spare time to organise, photo., and post many "through" trains, unfortunately. In 1963, in addition to the NB Type 2s, there are, of course, all the "Warships", the early "Westerns" (but not allocated to Plymouth, Laira), and most of the "Hymeks" (but not allocated to Plymouth, Laira, either and very rare visitors), but no D95xx Type 1s. There are all the BR single unit diesel railcars and, Rule One (because there were no Class 101 or Class 108, as they became, allocated to Plymouth, Laira), the 2- and 3-car DMUs. BR coaching stock is either BR SR Green or, increasingly, BR Maroon, with less and less BR WR Chocolate & Cream and very little BR Crimson or Crimson & Cream. BR SR steam continues with fewer Ns, more BR Standards, but still plenty of Bulleid Light Pacifics. 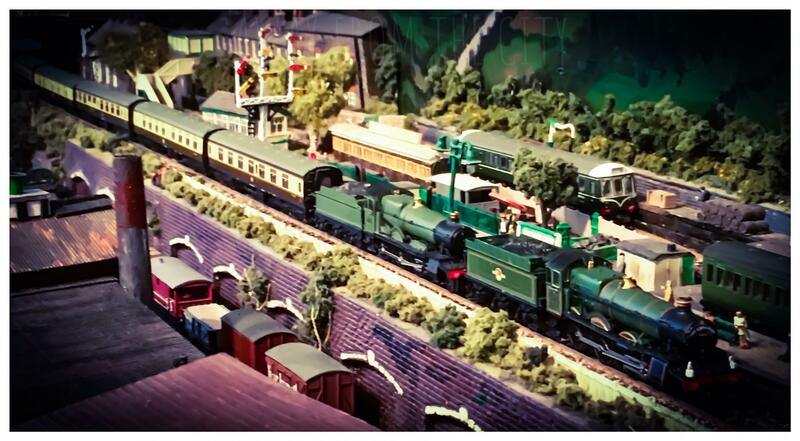 Of course, we can also add the preserved locos. and stock. The Castle Estates has agreed to purchase and pay for the restoration of an ex-SR 15ft. (long wheelbase) 'tarpaulin' type wagon and ex-GWR bogie steel wagon to transport loco coal for the CLPG and GWS respectively, and to sponsor the purchase of Somerset steam coal, from the mines near Withy Junction, to fill them. For local distribution of loco coal to Cant Cove and Penmayne, additionally, one standard SR and one GWR mineral wagon has also been purchased by the Castle Brewery and donated to the CLPG for them to restore and use. Additionally, the North Cornwall Pasty Co., of Penmayne, has purchased an ex-GWR Collett composite coach, No. 7059, which will be restored to GWR colours at Cant Cove and will work with BR WR chocolate and cream Mark 1 RMB Mini Buffet cars supplying hot pasties on special trains. Two of these RMBs are allocated to Wadebridge, one used for trains to / from Penmayne and the other to / from Port Perran and Truro. 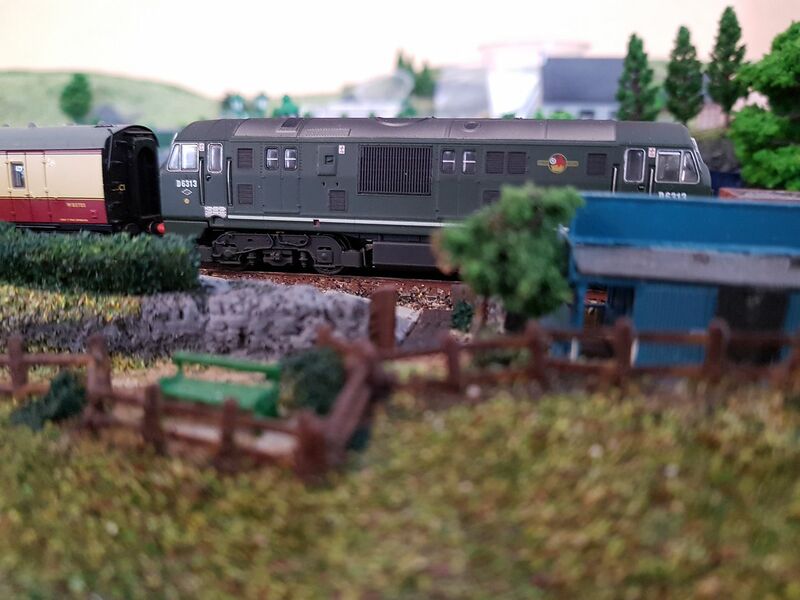 The railcar in the worst condition, (bought by the GWS Bodmin General), leads and is still in early BR Crimson and Cream and is followed by the two in BR Green livery, newly overhauled at Worcester Loco. Shed, for re-allocation to Penmayne and Port Perran, in late 1962 (when BR withdrew the last ex-GWR diesel railcars). The ex-GWR diesel railcar, bought by the GWS at Bodmin General, has now been restored at Worcester Works with parts from other withdrawn ones dumped at Shrub Hill loco. 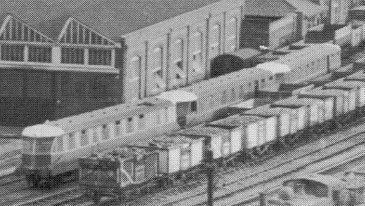 shed, in 1962, parts from which have also been used in the two other ex-GWR single unit diesel railcars in BR Green livery allocated to Penmayne (W30W) and Port Perran which are now allocated to off-peak services until BR has enough new single unit diesel railcars to replace them. The GWS's diesel railcar was repainted in GWR livery at Worcester Works' paintshop after repairs were finally completed by local GWS volunteers and is ready for service at Easter 1963. The ex-GWR diesel railcars had been transferred back to their old Worcester stamping ground in their penultimate year in service, 1961, with other examples working in the Severn Valley and around Tenbury Wells. The railcars final year in traffic was 1962; all 13 remaining examples had been withdrawn by October that year [except for the three transferred, by BR WR, to Penmayne and Port Perran, of course!]. 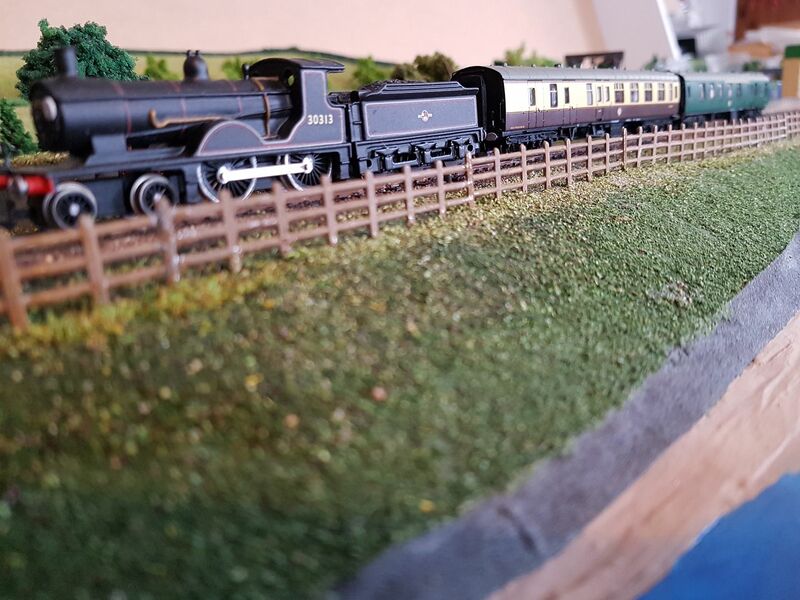 During their visit to Worcester, the senior members of the GWS (Bodmin) made another very interesting discovery in the sidings near Worcester Works and, thanks to a very generous offer of sponsorship, purchased it and have had it fully overhauled and repainted in BR livery. The mystery item is expected to be delivered in early Spring. 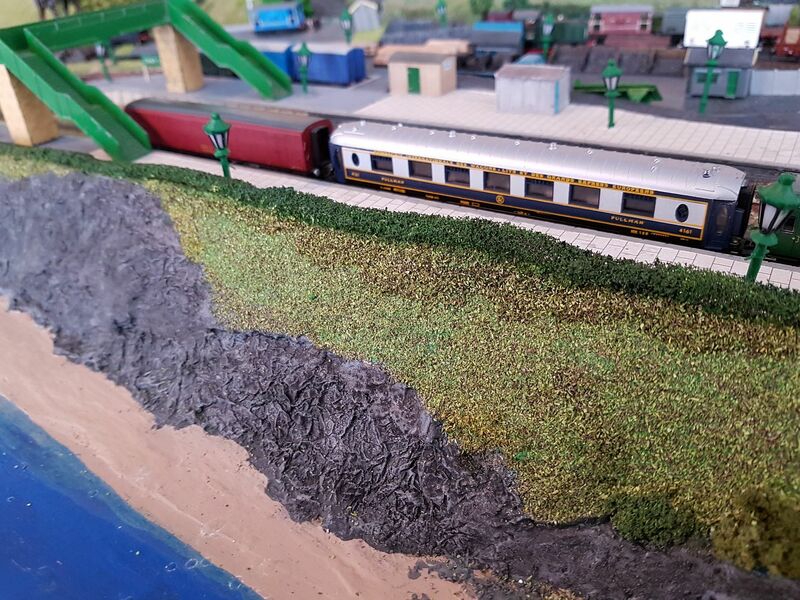 They believe it will prove very attractive not just in normal service between Penmayne and Wadebridge / Bodmin Road, but also for charters. 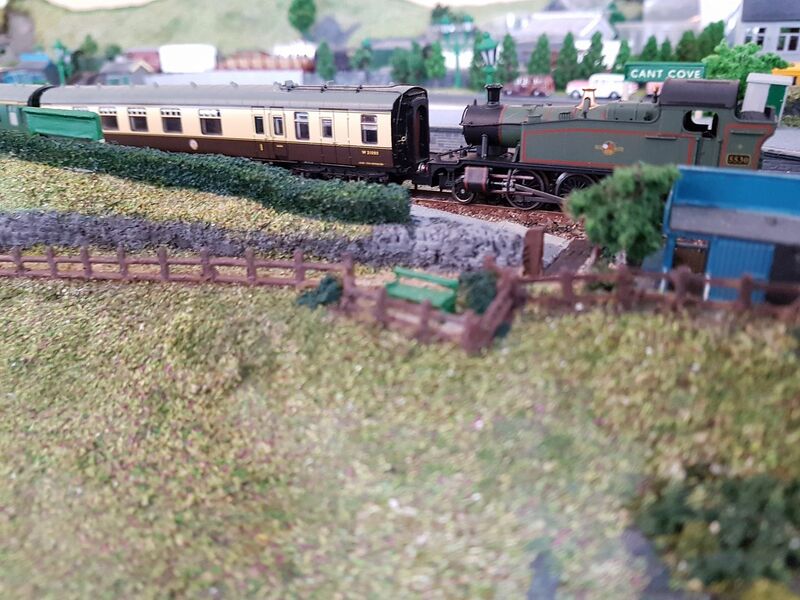 The shedmaster at Penmayne has confirmed the continued availability of the turntable for CLPG locos. based there and at Cant Cove plus the GWS's at Bodmin General, as well as BR ones, to save long-distance light engine movements to and from St. Blazey or Truro. At one point in the 1980s I lived just up the road in Droitwich, but was largely unaware of the Worcester area's railway history - no internet back then, though I suppose had I had a burning desire to find out I could have found something in a library, but my interests were going in different directions at that point. Anyway while I have long been aware of the GWR railcars, I'd always assumed they worked remote West Country branch lines, and was surprised to learn not so long ago that Droitwich Spa station was at one point the station through which the most railcars passed (something like 38 workings per day IIRC). 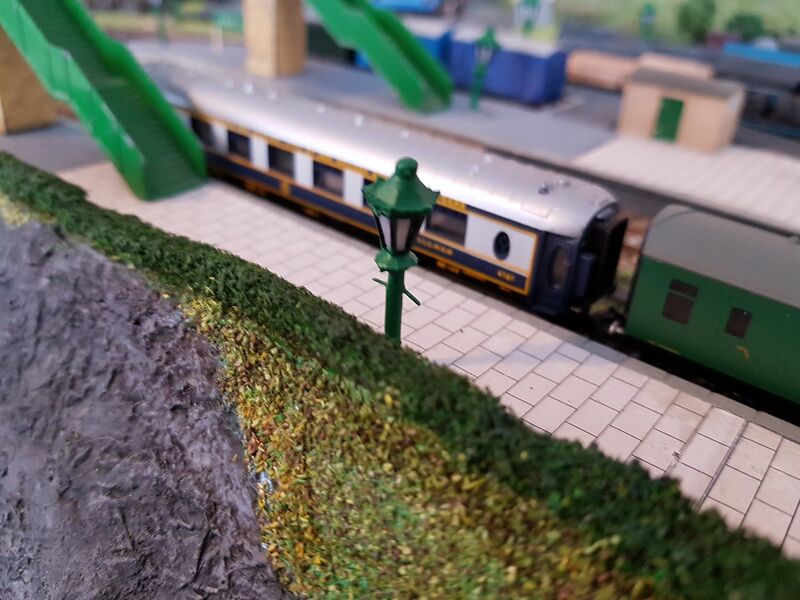 Details are unclear and require further research, but prior to that W30W has been sighted passing through Birmingham Knotmore Street, possibly going to/from Tyseley Works and/or working enthusiast specials. W20W (in Crimson and Cream) has also been sighted in the area on more than one occasion. The North Cornwall Pasty Co. has also agreed to sponsor a small fleet of twin BR Standard catering cars in BR WR Chocolate & Cream livery. Like the RMBs they will be based in North and West Cornwall. The RMBs are: W1813 BR Mark 1 RMB Restaurant Miniature Buffet, BR (WR Chocolate & Cream) which alternatives between North and West Cornwall, as required; W1814 BR Mark 1 RMB Restaurant Miniature Buffet, BR (WR Chocolate & Cream); W1816 BR Mark 1 RMB Restaurant Miniature Buffet, BR (WR Chocolate & Cream), North Cornwall, this also appears in Somerset; and W1821 BR Mark 1 RMB Restaurant Miniature Buffet, BR (WR Chocolate & Cream), West Cornwall. They are: W1902 BR Mark 1 RU Restaurant Unclassified, BR (WR Chocolate & Cream), based in North Cornwall; and W1919 BR Mark 1 RU Restaurant Unclassified, BR (WR Chocolate & Cream) which besides alternating between North and West Cornwall, as required also appears in Somerset, and the two coaches they, normally, work with: W7 BR Mark 1 RFO Restaurant First Open, BR (WR Chocolate & Cream), and W8 BR Mark 1 RFO Restaurant First Open, BR (WR Chocolate & Cream. The history of the final years of the ex-GWR diesel railcars in the Worcester (85) district is, indeed, a fascinating one. Alas, I do not remember seeing them in BR days but my late father did, and not only rode in some but also photographed some. They were allocated to Stourbridge and Worcester. However, the last ones at Stourbridge were withdrawn in January 1959: W7W, W8W, and W15W; and August 1960: W14W. W20W finished its BR service, at Worcester, in October, 1962, and W30W at Southall in August 1962. However, W30W was moved to Worcester, presumably for spare parts. W20W retained its BR Crimson & Cream livery to the end and is, of course, preserved in 'real life' restored, I believe, to GWR livery. The last 5, all allocated to Worcester (85A), were: W20W, W22W, W23W, W26W, W32W; W24W (82B; then to 85A?) Withdrawn: 10/1962. W23W (Dark Green, White cab roof, is preserved by Cornish Loco. Preservation Group, Penmayne). W32W 85A (10/1962) (Dark Green Grey cab roof -- White cab roof 09.1962, is preserved by Cornish Loco. Preservation Group, Port Perran. It may not carry its actual number). However, further developments are rumoured!